We will have a live call-in on-air today with our team from RCR Network. The topic for the show will be “Two Storms, One God: Becoming Resilient After the Storms”. After two major storms that hit America, people are loosing hope and questioning God about these storms. Our team are going to debunk all the naysayers about God and climate changes and give scriptures about why and how to become resilient with God in any disaster that comes in any form. Also, we will give information from all the states that was involved (from federal to local) and prayer for all that call-in and hear our radio network (RCR Network). Call-in today if you were in any of the states that these storms hit and affect your life: (712) 451-0200 Access Code: 302243. Give your status and testimony about how our Father God made a difference in your life, community, city and state. 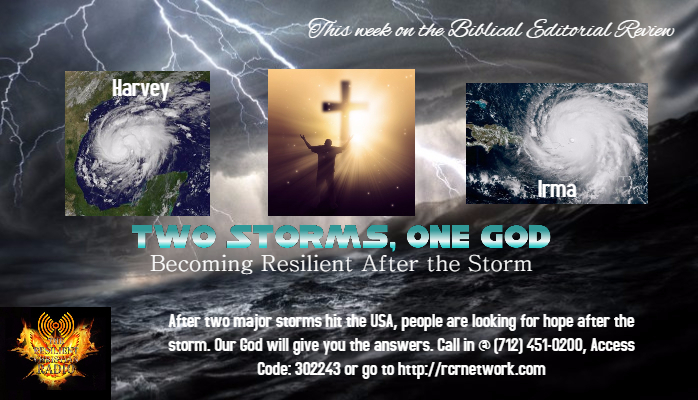 Please join us on this Thursday for Two Storms, One God @ 9 PM CST, 10 PM EST, and 7 PM PST.